Thor is the third in Marvel's lead up movies to the Avengers following Iron Man (one and two) and the rebooted Hulk franchise. On the basis of Thor alone Avengers is going to have to be some movie to better the films that are preceding it. Director Kenneth Branagh adds more than a little class to a film that could have easily got the (Marvel) Thor mythos so horribly wrong. It looks beautiful throughout, both in the scenes set in Asgard and those shot in New Mexico. Plot wise it's pretty straight forward. 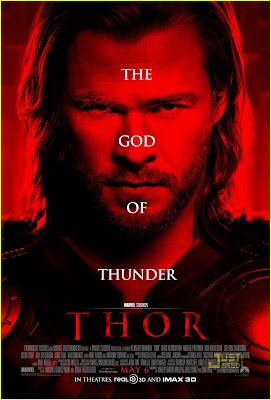 Thor (Chris Hemsworth) is young and arrogant and winds up getting banished to Earth by his father Odin (Anthony Hopkins). Loki (Tom Hiddleston), Thor's brother plays his part in helping the banishment come about and is soon installed as King, as Odin falls into a, never fully explained, mystical coma. On Earth Thor is unable to use his legendary hammer and is stripped of all his super powers. Befriended by a small group of scientists, including love interest Natalie Portman, Thor sets about trying to get his powers back and eventually restore order in Asgard. All as you would expect. What is a surprise is how good Hemsworth is as the lead and how Hopkins, like Brando before him, adds a sense of gravitas to proceedings as Odin: playing the role completely straight and giving the movie some weight. There's a lovely light touch to the comedy and Portman is once again excellent. Idris Elba does a great job at the gatekeeper to Asgard, Heimdall. Fans of The Wire may scoff at their man in a big gold suit, but any doubts about his suitability for the role have been kicked into touch by this performance. And that in a sense is why Thor works so well: it gets the small stuff right with even minor supporting roles shining. Yes it's an action flick with a heart and yes once again Marvel drop in some lovely moments for the fanboys, but as a superhero movie all of its own Thor is better than anyone had a right to expect. Captain America has some big shoes to fill this summer.